“They can’t all be winners,” like Steven Forbes likes to tell me from time to time, whether it’s about the comics coming out or the scripts I hand in for The Proving Grounds. His oft-repeated maxim rang true this week as there was not a single comic that caught my eye. Everyone did a pretty adequate job – a good round of applause for the gang – and there were some dips into the “less good” territory, but the fact remains that I didn’t find anything in this week’s comics to analyze and, doing so, give you something useful to use in your own comic endeavors. As such, I’m going to do something different this time. A couple of weeks ago, I had some Honorable and Dishonorable Mentions that revolved around the same concept: silent beats. Today we’re going to look back at these comics and further discuss what made them worthy of mention and how you can find a lesson lurking between their pages. But what are beats, really? Before we go any further, let me drag you screaming down memory lane. Anyone here used to play Dungeons and Dragons? Or still do? No one’s judging you. Hell, I’d play if I had people around who had both a grasp of the English language and an interest for role-playing games. Anyway, do you remember the notion of “rounds”? When combat started, we started measuring time in rounds, with one round the equivalent of the time it took to perform one simple action. In one round, you could, for example, swing a sword, cast a spell, or quaff a potion. More complex actions, like climbing up a 30-foot cliff or rearming a ballista, took multiple rounds to execute. On the flipside, you also had “free” actions which you could undertake anytime and that didn’t count as a standard action: call out to an ally or drop a weapon. It was a simple mechanic and it worked (but don’t get me started about “turns”). One thing was certain, if you fooled around with these rules, the Dungeon Master would set you straight (usually by throwing level-draining monsters at you). Beats in comics are a lot like rounds: they’re an informal measure you can use to determine just how much your characters can do inside a single panel and how many panels you’d need to depict an action. Generally clocking at one beat per panel and one action per beat*, there’s only so much a character can do in a single panel. A good rule of thumb is that any action that can be drawn in a single panel constitutes a beat. 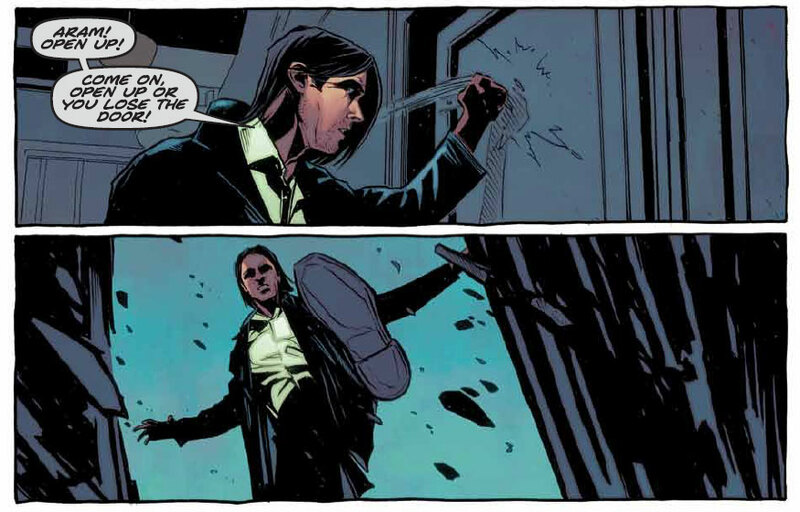 Rushing a bad guy is one beat, throwing a punch at him is another while his body smashing through the window behind him constitutes a third – hence three panels. If you need multiple panels to show an action, that’s multiple beats (example: a blinking light). *That’s barring exceptions like ghosting and most spoken exchanges. A problem arises when creators start thinking of a beat as “the space required to put in the dialogue I want.” This leads to having adequate beat sequence when dialogue flows but hitting gaps in border time as soon as silence is required. The most blatant examples occur when silence is called for in the middle of dialogue. To further demonstrates this, we’re going to examine examples from three different comics from two weeks ago. Lewis asks Rachel to listen. In the following panel, we actually see Rachel do exactly that. 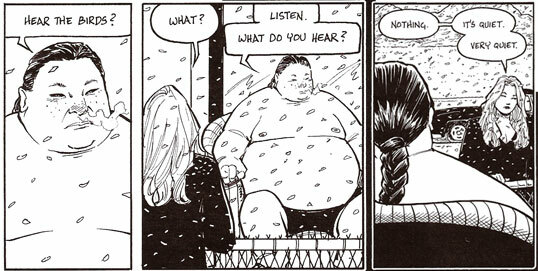 Even though “listening” could be considered a “free action” – all the characters are assumed to be doing it all the time, if only in order to carry a normal conversation – Moore understands that, in this context, it’s important to show the act itself, hence this silent panel. Thus, when Rachel tells Lewis that she hears nothing, her answer is lent more weight from the fact that we could literally see her in the act of listening and that we could actually not read any sound effects in that panel. In this case, the silent panel was essential in conveying a plot point, that is that the influence of the mysterious woman has on the town and its surroundings. As an amusing exercise, let’s look at the same sequence, this time minus the silent panel. Don’t you think that Rachel was pretty quick at dismissing Lewis? How much credence do you lend her reply? As you can see, it’s not because a panel is silent that’s it’s not saying anything. When the Colonels asks her to dump her boyfriend, Major Dallas doesn’t react; in fact, there’s even a whole panel devoted to her lack of reaction. Not only is this panel silent, it’s also void of either action or emotion. I can’t stress this enough: it’s a panel devoted to showing us the absence of something. But once again, as in the Terry Moore example, what we have here is a beat that’s essential to conveying a certain plot point. Don’t believe me? Have a look at a doctored version in which I removed the silent beat. See how the Major just seems curt or terse. Her following departure might even seem resentful. However, with the silence beat in its place, Edmondson and Gerads drive home their plot point that is Major Dallas’ ability to emotionally detach herself from even the most personal situations. This, like in the previous example, is something that will undoubtedly be used later in another issue, either to further a plot line or better define the character, and this silent still panel will have served its purpose in foreshadowing that development. So we have Jackie, banging on the door and shouting threats and then… immediately putting them into effect. Jackie is so upset that he’s not even waiting for an answer before kicking the door in. There’s a beat missing where Jackie waits for Aram to manifest himself. The more plausible option however seems to be that there’s a missing beat and this muddles the interpretation of the scene. I’m certain the creators had a perfectly good reason for lining up these two panels, but it’s not really apparent. Moreover, some of the interpretations can lead to the reading assuming inexistent plot points and characterization? Is Jackie really that impetuous? Did he ever genuinely intend to not break down the door? Are his intentions to cause as much damage as he can to vent his frustration? Did he have bodily harm in mind for Aram on his way to this place? It’s possible. But there’s no way to really know because the sequence of actions is missing a beat. The narrative is still highly readable; it’s’ just that it’s opened to a lot wider interpretation than what the creators probably intended. But wait, I hear you hypothetically saying, maybe they ran out of space and had to cut it short? After all, you’re always harping on about the finite space available in a comic book? To that I’ll answer: it’s not because something is limited that you’ll necessarily run out of it. You’ll only run out of space if you waste it, only if along the way you burned through some of those panels showing things that you thought made you look cool instead of things that gave your story meaning and structure. Mundane loitering, witty banter, useless splash pages – all pointless wastes of space that say more about your personality as a creator than they do about your story. Pull out your script, read, condense, revise and find those essential beats. What makes a beat essential – that was the original question. The answer is this: a beat is essential when its absence prevents the reader from enjoying the full depth of the story you’re telling. Terry Moore needed Rachel to stop and listen so we could appreciate the way the woman’s unnerving presence pervades the world around her. Edmondson and Gerads needed Major Dallas to sit there and look her superior in the eye, unfeeling and mute, so we could believe the way she’d behave in the face of the challenges to come. And Hine and Haun should have inserted that missing beat to better make us better understand Jackie’s state of mind on which most of their story is built. Essential is the quality of what is missed when lacking. Take out all of those baubles that your readers won’t miss if they never knew they were even there in the first place and the rest will shine even brighter for it. Actions in comics require beats, some of which can be skipped while others are essential to the story, either for plot or characterization purposes. When planning your panels, always ask yourself if all of the essential beats have been included. These are the beats that take something away from the reader’s enjoyment of the story or prevent him from correctly interpreting the narrative when left out. If your find yourself running out of space, go back through your script and take out anything that doesn’t either advance the plot or reveal character. Know to recognize what you included as an object of pride only – be honest with yourself. Jeff Lemire, Scott Snyder and Steve Pugh show us the most elegant way to do a crossover in ANIMAL MAN #12: by having the narrative intercept in one scene common to both books. In BEASTS OF BURDEN: NEIGHBORHOOD WATCH, Evan Dorkin and Jill Thompson show us it’s possible to have a silly premise with silly characters and still tell structurally sound and engaging stories. “Whimsical” doesn’t mean “to hell with logic”. Garth Ennis scores twice this week. In THE BOYS #69 with Russ Braun, he has a conversation continue in voice-over during another scene, thus creating some nice tension. Then, in THE SHADOW #4 with Aaron Campbell, he retells the hero’s origin story using the unorthodox viewpoint of the villains. 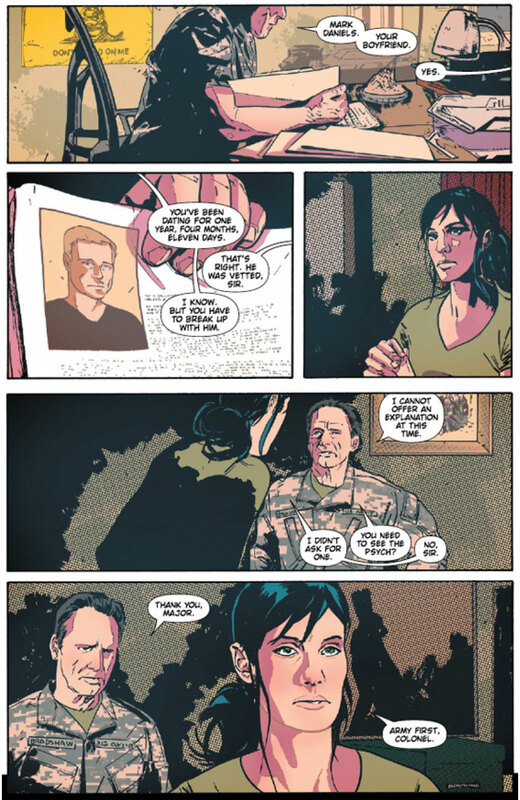 In HAWKEYE #1, Matt Fraction and David Aja blow up their narrative into multiple portions but still manage to have a cohesive easy-to-follow story using match cuts and foreshadowing, something that the team of BATWOMAN should have used for their “To Drown the World” story arc. MIND THE GAP #3 by Jim McCann and Rodin Esquejo continues to please with its “Filling In the Gap” feature at the end. It’s a treat to get some back material about the writing process since it’s a lot more common to get some about the art process instead. Ande Parks and Esteve Polls use moment-to-moment transitions to great effect in THE LONE RANGER #8. THE SPIDER #4 by David Liss and Colton Worley ends with a classic cliffhanger that’s perfectly in line with the pulp origins of their hero. 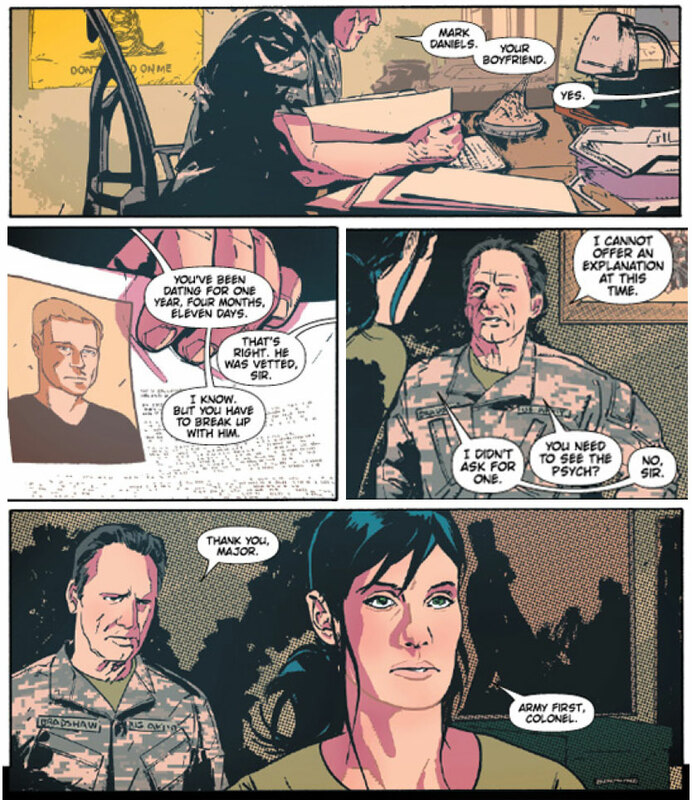 In THIEF OF THIEVES #7, Robert Kirkman, Nick Spencer and Shawn Martinrbough show their mastery of the match cut through dialogue when doing their scene transitions. Raffaele Ienco has a minor stumble in EPIC KILL #4 as he switches through three caption box voices with no transition whatsoever between them. HARVEST #1 from A.J. Lieberman and Colin Lorimer was a pretty good read except for those protagonist captions that get used on one page in the beginning and then disappear completely from the book. Matt Forbeck, Martin Coccolo and Atilio Rojo use a confusing set of flashbacks within flashbacks at the start of MAGIC THE GATHERING: THE SPELL THIEF #2. “They can’t all be winners” really seems to be the theme this week as Scott Snyder, Jeff Lemire and Marco Rudy miss an opportunity for a great page-turn reveal in SWAMP THING #12. And there you have it! Come back next week to enjoy some more Points of Impact!